Paired with a physician's note, this medical resignation letter allows an employee to resign due to health reasons. My doctor has advised me that my health will no longer permit me to keep up a full-time job. It's no secret that I haven't been well - I have had to take a considerable amount of sick time, as you know - but I had hoped that things would get better. However, I can no longer keep up the standard of work that I prefer to do and my energy level is getting so low that it's an effort to make it through the day. Therefore, I must resign, effective July 13. 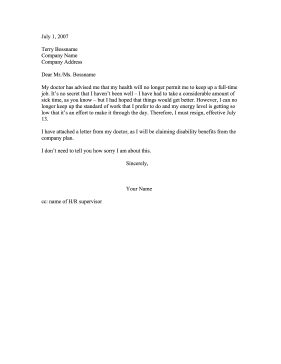 I have attached a letter from my doctor, as I will be claiming disability benefits from the company plan. I don't need to tell you how sorry I am about this.